Jan 14, 2016 / Comments: 0 / Goodbye Gustav! Divinity radiates itself in the moment of being. in the love songs in honor of God. 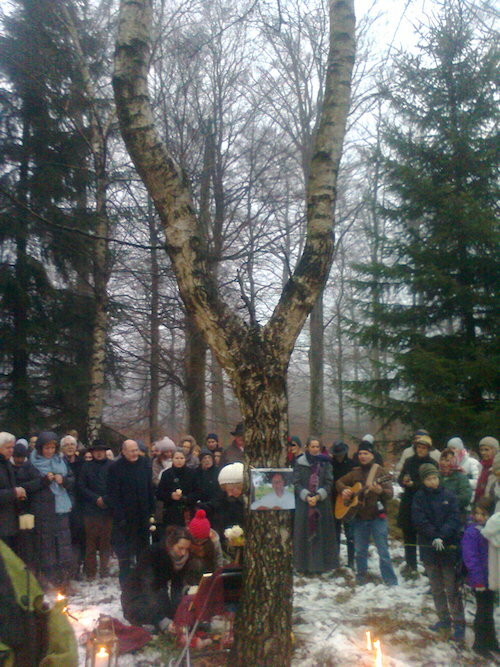 We are deeply touched and grateful for the last few weeks and the farewell ceremony with Gustav in the Reinhards forest. Besides all the intangibility with which we all are confronted, such a radiant love energy has opened up which connects us all and can give us an idea of what awaits us all when the time is ripe for it. And, now already! Swami Kaleshwar reminded us again of how important the energy of a group is. In such a moment, to know that so many people are with us with a wide-open heart, right in the woods, and everywhere else in the world (! ), was a huge gift for us !!! “Mensch, Gustav,” Rolf said in his speech again and again… yes, Mensch Gustav, Mensch Papa and Mensch Darling! We’ve been through a lot with you, but that is really the high point. You shocked us all and brought us together simultaneously in such a wonderful way. You were always uncompromising if you knew what you wanted and, so, this time, too. From experience, we can say that from this the very best always developed. Your soul lives in constant search for the truth. May your boldness inspire us all and bring us together again and again in this sense. PS: With all my heart thank you very much for the monetary donations. Your generosity moves us deeply. Thank you! 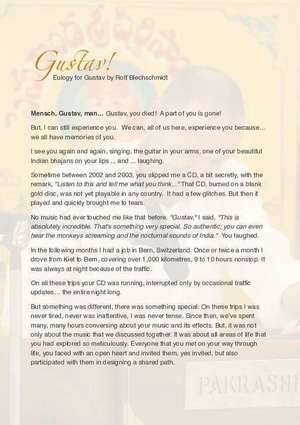 Here is the touching eulogy delivered by a dear friend of Gustav’s, Rolf Blechschmidt. Rolf shared this eulogy with friends and family at Gustav’s memorial at a beautiful cemetery deep in the nature called the FriedWald forest. Gary Taylor, a longtime family friend and senior student of Sri Kaleshwar wrote a wonderful poem for Gustav. You will find the original English version of the poem as a PDF Download. Enjoy an unabridged live recording of the last major music event with Gustav. We are making the final in this night of spiritual songs in Kassel on Nov 16th, 2015 and do a few organizational announcements as an organizer. Veemala begins at the 8th minute. The special thing about this evening is that Gustav was exceptionally active and even introduces his new Shiva Bhajan, beginning from the 18th minute. Enjoy! And when do we meet again? Many said that it would be so wonderful to be back soon to celebrate such a togetherness-fest, but without having to experience a loss. An opportunity to do so is concrete the Bhajan Mela at Pentecost! It would be nice to be able to reach you directly through the distributor of Shiva Mandir Music. [HERE] you can subscribe to the Shiva Sai Mandir Music Newsletter. This is the final post in Gustav’s blog. We thank you all for your open hearts and the love that you have shared and send our best wishes to all of you!